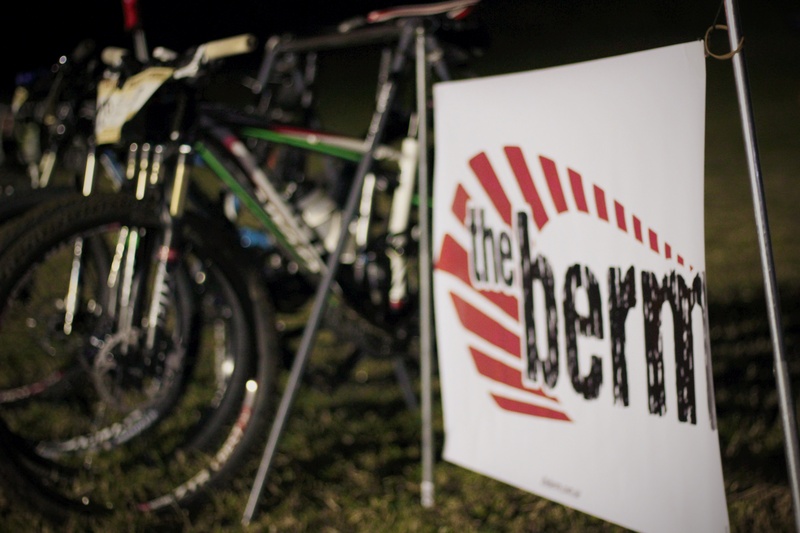 As I rounded transition for my eighth lap of the Dargle Farm course I knew my first venture into 12 hour mountain bike racing was soon to be over. 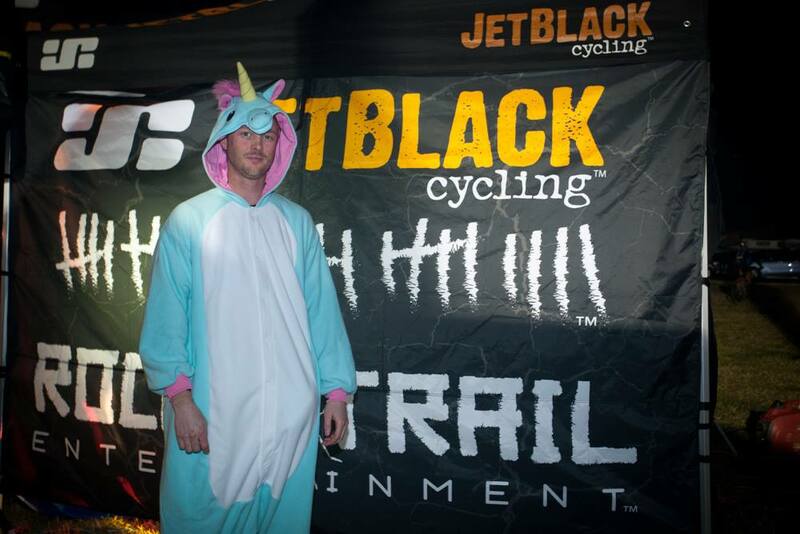 Initially my lead up for the JetBlack WSMTB 12 Hour went according to plan. 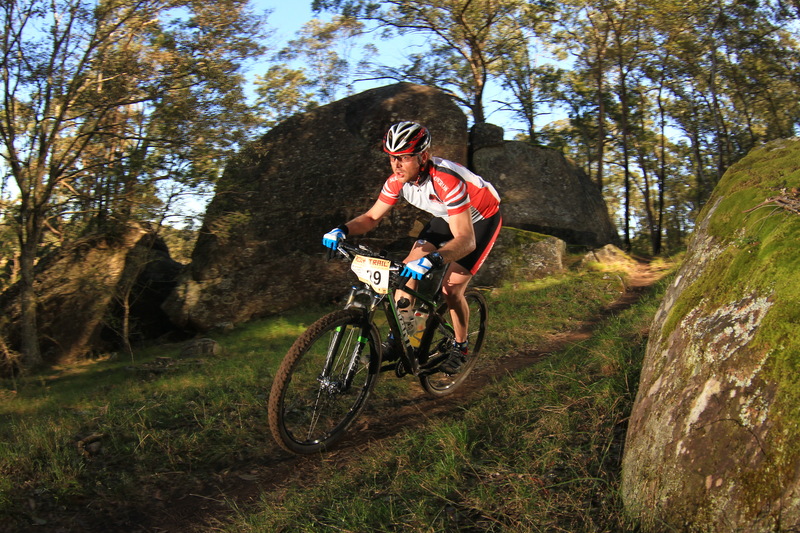 The week preceding saw me ride more than 350km including some long stints on the mountain bike and some solid racing during Round 4 of the CORC XC series at Mt Stromlo. I felt fit and confident leading into the week before my first 12 hour race. I started feeling the signs of an oncoming head cold on Monday morning when I woke up and got ready for work. I started taking cold and flu tablets and increasing my fluid intake to try and limit the duration of what starting to build in my sinuses. I decided if I was going to beat this thing I would need to stay off the bike and out of the Canberra cold. By Wednesday I was feeling the effects of a full blown head cold complete with sore throat, headaches and blocked sinuses. I still hoped I would be able to get some, albeit short, time in the saddle. On Thursday I picked up a Soldier On banner to set up at the event centre, I then packed my race bag, camping gear and prepared Kate the XTC for the drive up to Dargle Farm the next day. Health-wise things got a little bit worse for me. A case of gastro set in and I was riding the porcelain bus for the next several hours. My ideal lead up had well and truly sailed off into the distance. Friday morning I packed the car and headed up the Hume Highway / M7 / M5/ back-roads / random car ferry and arrived at Dargle Farm to set up my camp site. Fellow Bermers; Ben, Adam and Nigel were already there and almost set up. My minimalist approach saw my site up and running in a few minutes. Without much coaxing I was lycra’d up and soon Ben, Adam and myself were off for a recce lap of the 9.9km course. 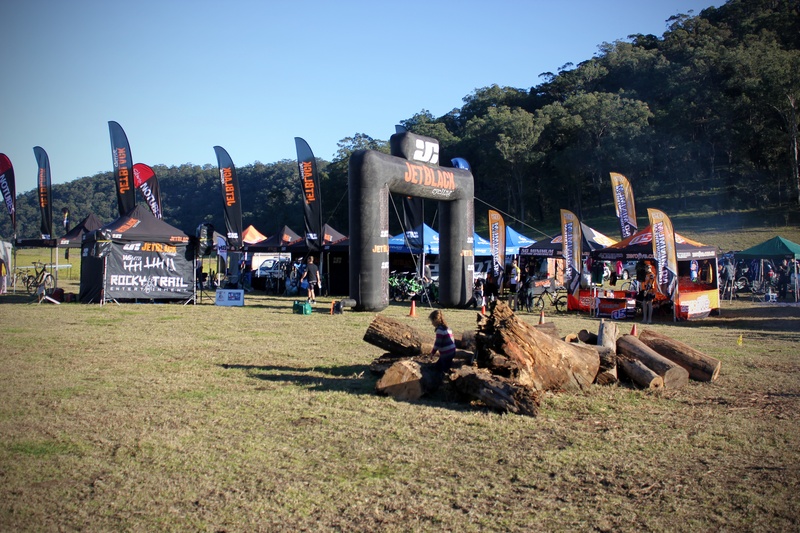 I didn’t know what to expect from this course; I had been told it had some technical singletrack, open fire-roads and a tricky climb near the end complete with a rocky pinch to overcome before the rewarding downhill back into transition. 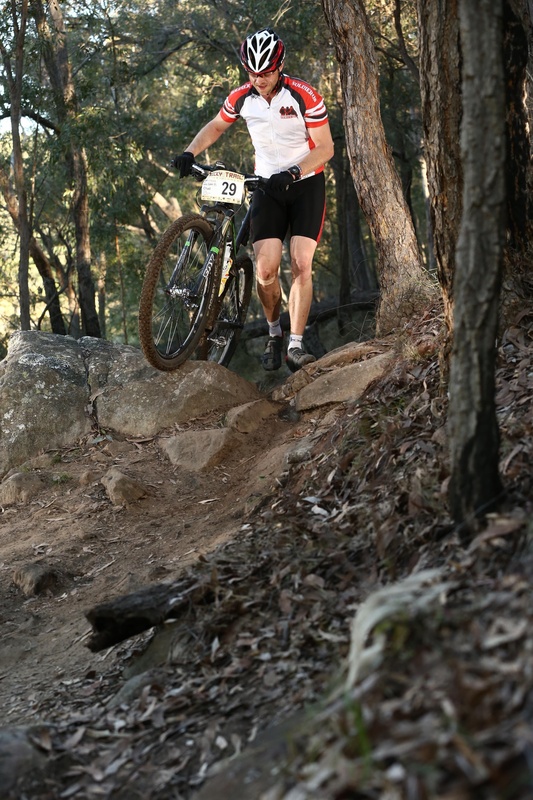 The first part of the course was a short stretch of fire-road leading into some impressive singletrack. The thing that immediately struck me was the construction of the trails. More often than not; trail-fairies will manipulate the landscape to suit a more fluid track. Dargle Farm was the opposite; the trails had been built to accommodate the natural features and embrace the various obstacles. After overcoming a few tricky corners and drops complete with some tree hugging from Adam; we were off onto the next part of the course. Some short fire-road linking into some fast and free flowing singletrack. About seven kilometres into my introductory lap of Dargle Farm I rode over a small branch and tore open my rear tyre. I had been contemplating changing my Crank Brothers wheel-set to tubeless during the week but opted out due to the valves not sealing properly last time. As I pulled a three inch long stick out of my tyre and tube I knew even a tubeless set up wouldn’t have kept me pedalling. 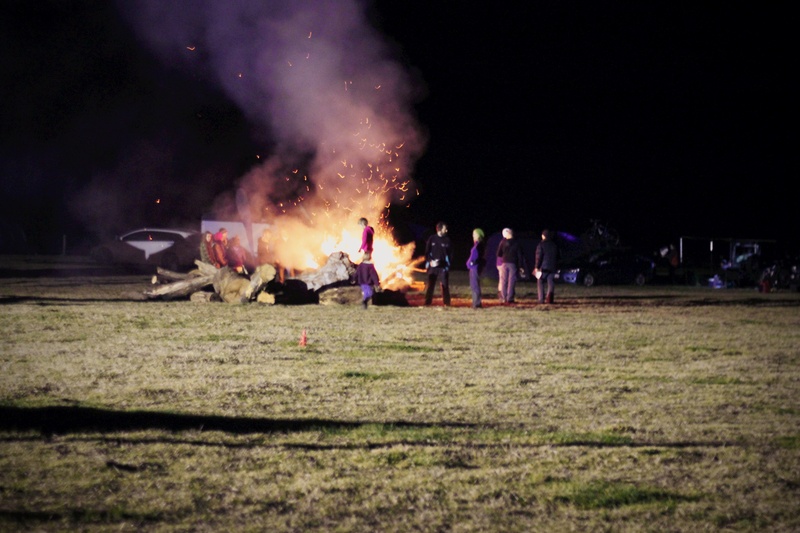 I wasn’t too keen on flipping the XTC and changing my tube in the thick mud so I limped back to the staging area and did my repairs and finalised my prep for the next day’s race.
.:The Berm Banner on display:.
.:The first bonfire of the weekend:. 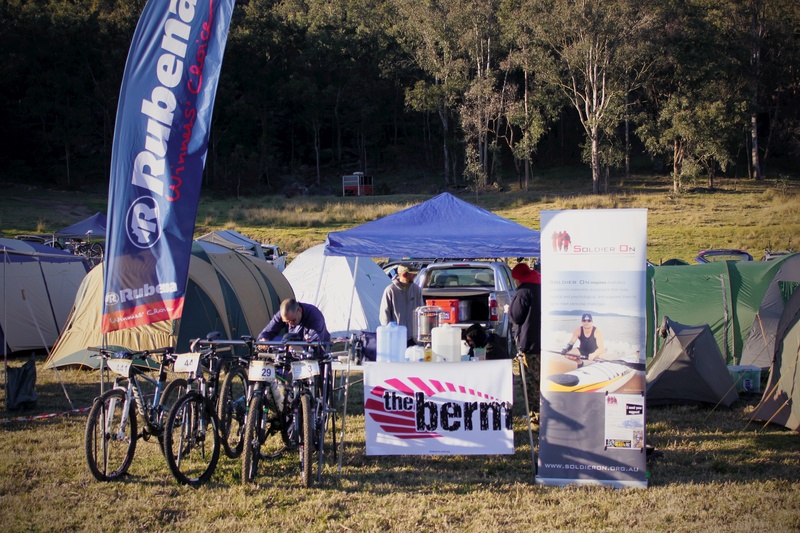 I woke up with a fairly stuffy head from the cold night before and tucked into a breaky roll and coffee before getting changed and ready for the rolling start at 9am.
.:The Berm / Pedal4Pierce / Soldier On Race Headquarters:.
.:Just a few thousand dollars worth of carbon and aluminium:.
.:Ready to tackle the Dargle Farm course:. 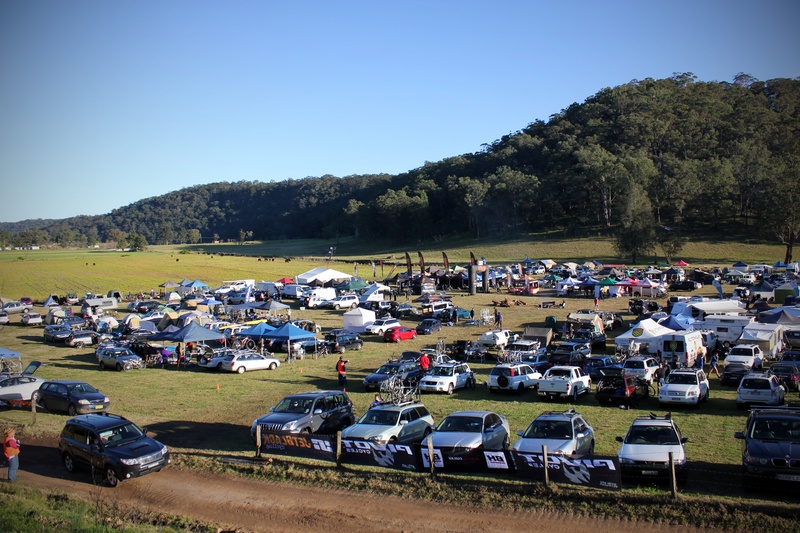 The race began slowly with a rolling start with a couple of hundred riders heading down the fire-road and into the singletrack. As was expected it was slow going and plenty of walking the bike until the field spread out and passes were able to be made. I started with a steady pace averaging 16.9km an hour over my first lap. Already I was starting the feel the heat and was sweating profusely. I was very happy to have shed the knee warmers and opted not to wear my usual long sleeve shirt under my jersey prior to the race start. I was sticking to my hydration plan of one bottle per hour so after finding my flow for the second lap I rounded transition and pushed onto my third. I had found a pocket of similar paced solo riders and followed them through the singletrack and pushed past them on the fire-roads. I had to slow down a little to avoid blowing up too early and was soon being over taken by the team riders. At the end of my third lap I was averaging 16km an hour when I pulled into race HQ for a bottle change and quick feed. Already the temperature had risen to 22’C and I was feeling the vast difference between here and the relatively freezing temperatures of back home in Canberra. I started off on Lap 4 and saw a bunch of slower riders heading into the singletrack. 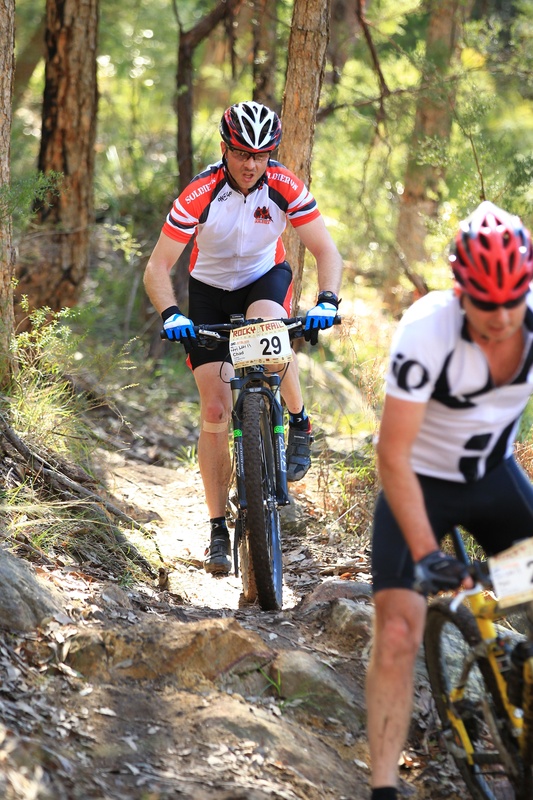 Not wanting to get bogged down and lose momentum I pushed past them and powered through the first singletrack section and down the rocky drops into the first section of extended fire-road. Coming out of the cool trees into the full sunlight was a shock. I could feel the sun starting to burn my skin and see the sweat dripping across my glasses and onto my bike.
.:Digging Deep and trying to avoid hitting other riders:. Halfway through Lap 4 I felt the familiar rumblings in my stomach. My digestive system wanted to purge itself of the morning’s breakfast and coffee… and now! I rolled through transition and onto Lap 5 and then made a detour towards the toilet block. I’ll spare you the details but I wasn’t feeling the best. I pushed onto Lap 5 and found I was starting to get a headache. I had been sticking to my nutrition/hydration plan and felt reasonably comfortable in that regard. Lap 6 was more of the same. I had slipped into a routine of casually riding the first section of singletrack, pushing out on the fire-roads, dealing with the technical singletrack and then attacking into the climb. I was enjoying myself and relishing the times I was in the trees and out of the sun. Although the climb was tough and easier to walk most times, I pushed up as best I could and looked forward to the downhill section leading into transition.
.:Dargle Farm – Down the Hill:. I took an extended 20 minute break before I pushed onto Lap 7. Even though I was feeling quite sick already, I made the effort to have a bite to eat and swap out my bottles. I pedalled off onto the seventh lap and instantly felt my energy levels drop and dizziness start to set in. Lap 7 was the beginning of the end for my 12 Hour venture. I found the final climb incredibly difficult this time around and walked the pinch with a lot of other riders. I decided to push on with my eighth lap even though I knew I would soon be stopping. My legs were feeling good but the rest of me had started to give up. I had a blistering headache and was starting to feel nauseous. Halfway through the lap I began to vomit and any attempt to take on fluids was met with immediate evacuation from my body. I was experiencing a form of ground rush and dizziness was starting to affect my balance.
.:Rider 29 – The new Mayor of Struggletown!:. As I rolled past the timing area at the end of my eighth lap I headed straight back to our Race HQ. My race was now over and I found a nice shady spot to lay down and try to cool down and stop the world from spinning. While my first 12 Hour had been a failure in many regards I put this aside and started focusing on helping out the Pedal4Pierce team and solo rider Rocket Rolls. Preparing the bikes for night riding was on the agenda and so was sorting out new bottles and food. Adam was keen for pizza and I made sure it was waiting for him in between laps. The P4P team were smashing out the laps and amazingly Ben was riding his fastest laps in the dark even after riding throughout the day. 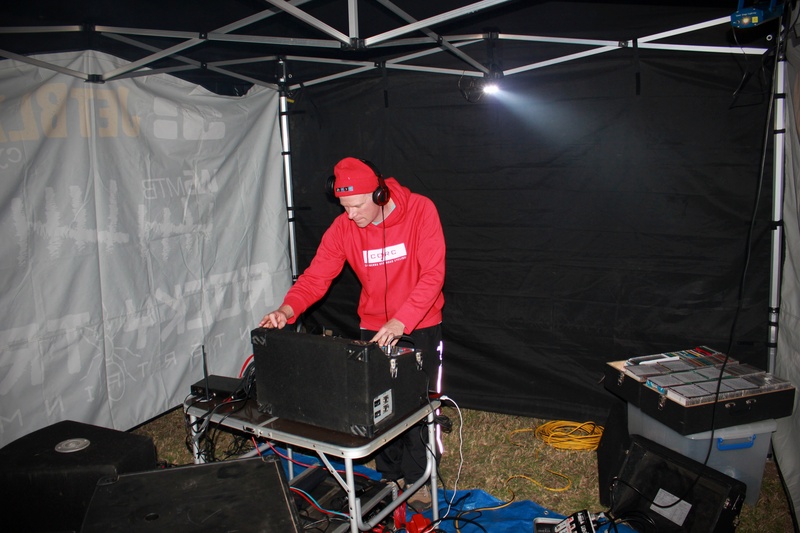 While the boys were tearing up the course, P4P co-founder Nigel was busy in the DJ tent busting out some phat beats. As the night drew to a close, both Adam and Ben smashed out their final laps minutes before cut off time. At the end of the night the course was closed and the presentations completed, there were smiling faces everywhere; and even a unicorn. On the Sunday morning I packed up and headed for home feeling tired, sick and dejected. 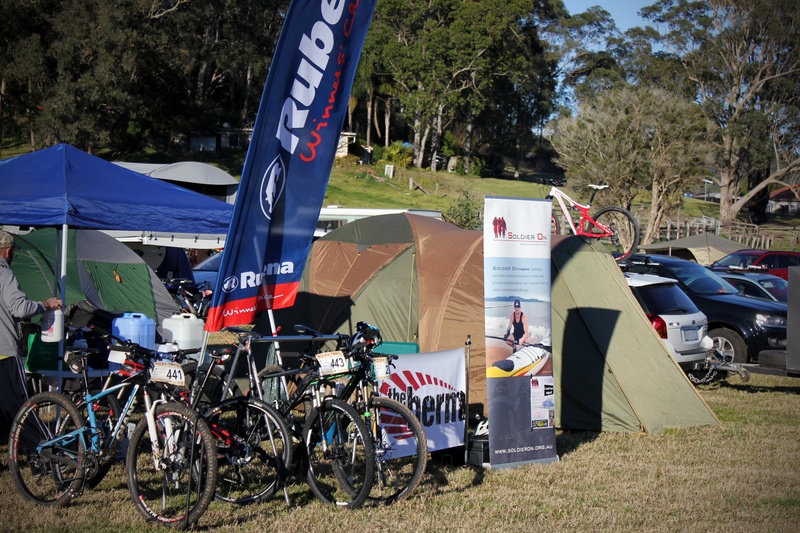 After all my gear was cleaned and packed away I contemplated if I would ever attempt another 12 Hour race again. Next Post Where Is My Flow?